It has been known by the electric transmission industry that electric power transformers are aging rapidly and will have to be replaced or repaired when the expected service life comes to an end. 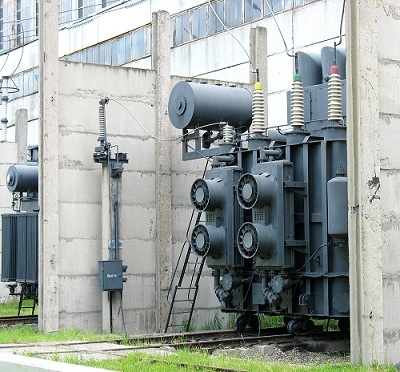 The price of replacing transformers however, has increased tremedously and placed a great financial burden on transmision companies and other owners of oil filled transformers. Electric generating and transmission companies therefore, have been forced to seek less expensive alternatives to extend the service life of their current equipment. The service life of the transformers is mainly determined by the condition of the magnetic conductor and the cellulose insulating paper otherwise known as the “Soild Insulation.” Any damage done to the solid insultaion will have a negative impact on the service life of the oil filled transformer. In theoretical terms, the service life of the magnetic conductor is unrestricted, but the cellulose insulation can get old and deteriorate very quickly. The service life of the transformer therefore, largely depends on the condition of the cellulose insulation. A wide range of factors, that speed up the aging process of the cellulose insulation are as follows: (1) excessive heating; (2) high moisture and oxygen content in the insulating oil; and (3) bi-products of the oil aging process. It is worth noting that it is the cellulose insultatoin that attracts contaminants by performing the function of a filter. The solid insuation retains the products of the oil aging process and those products work to degrade the solid insulation over time. More impurities are normally found in the solid insulation than in the liquid insulation. It is therefore, the purification and cleaning of the cellulose insulation that is one of the most significant processes required to extend the service life of the transformer. This process can be divided into two sub-processes such as: (1) oil reclamation; and (2) the washing, cleansing and purificationof the cellulose insulation. The following is a discussion of the existing ways and methods used in cleaning and removing contaminants from the cellulose insulation. A complete change of transformer oil is not a solution to the problem because not all the contaminated oil is removed from the windings and the solid insulation. Some amount of the products of the aging process are retained in the solid insulation and eventually leach into the new oil effectively reducing the service life of the new oil. This process represents a circle of continuing contamination and celulose degradation: the aging products oxidize the fresh product, which gets old and again saturates the cellulose with decay products. The process of oil reclamation is almost the same as changing the oil, though it is much more thorough and much more cost effective. The insulation may be washed over while performing a complete overhaul. The aging products are removed due to spraying of pure process oil. The disadvantage of this method is that the aging products are not removed in the depth of the insulation. The effectiveness of the washing is improved by using special detergent oils. But, they are very expensive and the process lasts longer than the usual one. The overhaul and the cellulose purification make up asmuch as 30% or more of the new transformer value. GlobeCore branded equipment, designated as CMM-R line, is the most cost effective solution to use in order to extend the service life of transformers. GlobeCore produces highly-effective systems for the purification, degassing and regeneration of dielectric insulating oil. The distinctive feature of the GlobeCore CMM-R unit is that it allows the operators to work with insulating liquids while transformer is energized. GlobeCore equipment therefore, solves a wide spectrum of problems related to cellulose insulation purification. The general operating principles of the CMM-R unit are as follows: (1) it is connected to the operating transformer; (2) the oil is circulated through the equipment; (3) contaminated product is removed from the transformer, then passes through regeneration and degassing blocks; and (4) purified and regenerated oil is then returned to the transformer. A high circulation speed allows for the removal of aging and contamination products from the solid insulation. The purified oil again returns to the CMM-R unit, where it is degassed and regenerated once again. Other important advantages of the equipment, designated as CMM-R, are as follows: (1) minimal oil loss during the regenaeration process; (2) oil reclamation and solid insulation purification are performed simultaneously; (3) the regeneration of Fuller’s earth (adsorbent) inside the equipment is eco-friendly; (4) uninterrupted operation of the transformer; and (5) the service life of the cellulose insulation is extended due to the complete removal of aging products and contaminants. The results of the laboratory analysis of oil processed with the CMM-R equipment are given below. The analysis shows that the performance characteristics of oil, processed by GlobeCore branded equipment, comply with IEC standard 60296.